If you are looking for an Easter table decoration and a cute dessert, then look no further than this magnificent Easter Bunny Cake. You don't even need a special cake pan! 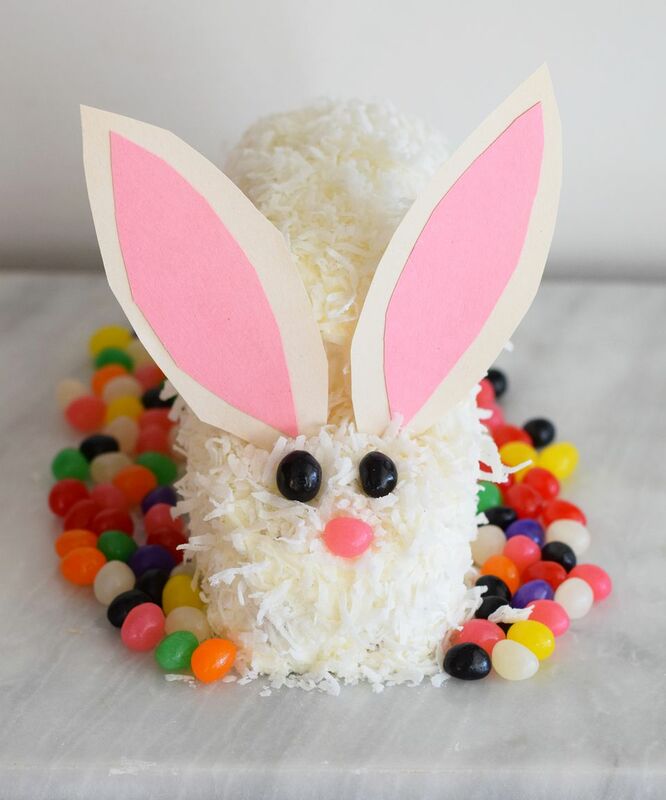 Just follow these step-by-step instructions and we will walk you through how to make an adorable, sweet-treat that even the Easter Bunny will be jealous of. Take a single 8- or 9-inch round cake layer and freeze it for 1 hour. Cut the layer in half as shown. Stand the layer halves together up on its cut edges. Cut a notch in the two pieces approximately up one-third the way from one end of the body to form the bunny head. Frost in between the cake-layer halves. Also, frost the bottom of the cake, so it won't slide around on the serving plate. Choose just the right serving plate. You may need a plate that not only will hold the bunny but would fit in a cake carrier tall enough for the bunny ears, if you are traveling with it. Ice the entire bunny with 1 1/2 to 2 cups of frosting. Using one of the notches cut from the cake layer, form a bunny tail. Add the tail to the bunny body and cover it in the frosting. The frosting should be enough to hold the tail on the end of the bunny body. Sprinkle the entire bunny body with 1 cup of coconut shavings/flakes. Use your fingers to lightly press the coconut into the frosting. There are lots of bunny ear options that you could pursue, like dried fruit roll-ups or cutting out white and pink construction paper. We decided on the latter of the two options, as it is super kid-friendly, and rather adorable! To make the eyes and nose, use jelly beans -- black ones for the eyes and an orange one for the nose. If you are using red or pink for the ears, you could use red or pink jelly beans instead. To decorate the serving plate, use 1 cup of green tinted coconut and sprinkle with jelly beans. Or just use jelly beans or another Easter candy favorite! Slice up and enjoy! Don't Waste Those Hot Cross Buns Make a Pudding.